I t is lonely out here on the range! There is no one to talk to except my horse, and the cactus. The ramrod of the 4d Ranch sent me out here to gather up strays that might have wandered off from the herd. The boss and his family were going to lose the 4d if something wasn’t done quickly. I had found a few doggies, but that wasn’t enough to help save the ranch and, to make matters worse, the boss’s son had become a drunkard. Every night he would go to Zeke’s bar in town, and drink all of his father’s money away. If anyone said anything to him, he would want to fight. Most of the time he would win but when it looked like he wouldn’t, he would draw his gun. Luckily he didn’t shoot anybody, but often he came close to it. He would come home to the ranch and stumble in the door; call his sister names and demand that she fix him something to eat. After he ate, he would lay on the sofa, in the parlor, and fall asleep. He would always tell his little sister: “Ever since Ma died, you have been Pa’s favorite, he is gonna leave you everything, but not if I can help it.” He muttered this while he was passing out. What his pa and sister didn’t know was that he had made a deal with Zeke. They would gather up some rustlers, and have them rustle the herd of the 4d. Zeke would sell the rustled cattle and split the money with Ben, Zeke’s son. In the end, Zeke would buy the 4d Ranch and give Ben enough acres to start a ranch of his own. One night as I was watching the herd, some rustlers came riding over the hill, they were whooping and hollering, and shooting their guns in the air. I tried to keep the cattle calm, but they stampeded anyway. I spurred my horse to get in front of the herd, I was going to turn them. They were headed for a cliff and, if they went over, they would all be killed. I was so lucky, I got in front of them, and I turned them at the last second. Some of the wranglers from the 4d were on their way back from town, saw what was happening and rode towards the rustlers with their gun blazing. The rustlers rode off. When all of us got back to the bunkhouse, we sat around and talked about it, then we went to bed. The next morning before breakfast, Jim, the ramrod, walked toward the ranch house. We all knew that Jim was sweet on Miss Millie, so we thought he went to the ranch house to have breakfast but just a few minutes later he came back to the bunkhouse. ‘Ned, the boss, wants to see you,’ was all he said. I had no idea what he would want to see me for, but I did as I was told. I knocked on the door and, as I was waiting for someone to answer, I paced back and forth on the porch, trying to think why the boss would want to see me for, as far as I knew, I had done nothing wrong. “What do you mean?” I asked. “You’ll see!” he said, and directed me to the parlor, where the boss was sitting, in an overstuffed, leather chair. Miss Millie was sitting across from him, in a chair with lace all around it. The boss told me to sit on the sofa and reached for the decanter of whisky, sitting on the table beside him. He poured two full glasses from the decanter, and offered one to me. “Jim told me what you did last night, boy. Thanks!” He raised his glass and I gently banged mine against his. When we were through talking, Miss Millie saw me to the door, meanwhile Ben had gone upstairs, probably to drink his own whisky. I couldn’t get the beautiful Miss Millie out of my mind all of that day. I had never seen such a pretty girl in all of my life. I knew the ramrod Jim was sweet on her, but I just couldn’t help myself. That girl was going to be mine! I dreamed about her that night and woke up with a plan. I told Jim my stomach was bothering me, didn’t eat breakfast and told him I would be along later. I waited until all of the wranglers had left and then I went to the ranch house. I was about to knock on the door, when Miss Millie opened it. “Come in. I have been expecting you,” she said, and winked at me. I took my hat off, as she took my hand and showed me to the immense kitchen. She pulled a chair out from under the table and asked me to sit down. As I sat, she went over to the stove and poured two mugs of coffee, put them on the table and sat down across from me. I had a date and I hadn’t said a word, but it was alright with me. I joined Jim and a few of the boys while they were mending fences that the cattle had knocked down during their stampede and tried to keep my mind on my work, but the vision of Miss Millie kept flashing in front of my face. “Bring that wire over here.” ” Can’t you understand English?” These remarks, and more, were made to me all the rest of the day. That night it was very quiet in the bunkhouse and, after supper, I sat with my head in my hands, thinking of Miss Millie’s beauty. I realized then that I was in love with her and she hinted, that I was something special to her, but what about Jim? How were we going to show up at the dance together? The rustlers were getting braver now, they set fire to the barn and the bunkhouse, and they even threw fire-torches at the main house, as they rode by, but Jim was ready for them. He had us practice a bucket-brigade; he had us place all the buckets that we would need to put out a fire, by the watering trough. We put out the fires in a few minutes and they did no harm to the buildings,. 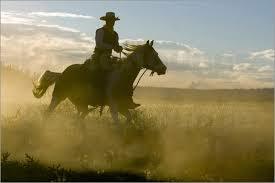 A few of the men chased the rustlers into the night, but it was too dark to see them, so they turned back. We all went into the undamaged bunkhouse, and laughed at those foolish rustlers and raiders for thinking they could burn down the 4d Ranch. “We scared the hell out of them!” said Lloyd, one of the wranglers. The next day was Friday, there was only one more day before the dance and I spent the whole day thinking it was me, that was gonna take miss Millie to the dance. At last it was Saturday and I spent the whole day trying to keep from sweating. Oh sure, I was going to take a bath for the dance, but I didn’t want any lingering odours coming from me. I just sat in my saddle and enjoyed the warm sun on my back. When night began to fall, I went into the bunkhouse and heated the water to take a bath. “Whoo! You smell like a French whore”, Lloyd said to me when I finished my bath. Then it was time for me to go to the ranch house, to get Miss Millie, so I hurried up the stairs to the porch, and knocked on the door. I had never seen a prettier picture in my life than Miss Millie. Her hair was brushed to below her shoulders and she wore a gingham dress that fitted her perfectly. I don’t know why, but I turned and saw Floyd standing there, with the Sunday go-to-meeting rig in hand. We walked down the steps and, while Floyd held the team of horses, I helped Miss Millie into the carriage. Floyd told me he knew all of the time that I was taking Miss Millie to the dance, but Miss Millie made him promise to keep it a secret, Lloyd gave me a thumbs-up sign as I sat next to the prettiest woman in the territory. Our bodies touched, she felt oh-so- warm in the chilly night air. Maybe it was wishful thinking, but I thought she moved even closer to me. Lloyd gave me the thumbs up sign again as I clucked to the horses; even the horses seemed like they wanted to go to the dance! We got to the old barn dance in time and there was a boy that took care of the horses, as we went in. Old lady Oriely was playing her fiddle, and Mrs. Jones was playing the piano while Mr Jones banged away on the tambourine. The band was playing ‘Turkey in the straw’ while the dancers did the polka. A person did not have to look twice, to see that everyone was having fun. Girls were dancing with girls while the young fellers were standing against the wall, laughing and joking. Every now and then, one of the young men would cast an eye at a girl who would turn red and look at him back; it was never long before he went over and asked her to dance. Then Jim showed up and later Millie’s brother came in. Everyone could tell he was drunk. Jim didn’t answer but went to the refreshment counter, and ordered some apple cider. “Are you going to drink that straight?” asked Ben. Jim is seething but still he does nothing. Ben, disliked Jim, ever since his father made Jim the ramrod of the 4d ranch. He felt it should have been him that his father chose. That did it! Jim gave Ben one punch, sending him crashing to the floor. Ben, still laying on the floor, took out his gun and shot Jim in the head. People came to Jim’s aid but it was too late. Jim was dead! Ben was hung for murder that year and I was made ramrod of the 4d Ranch. Zeke told the rustlers to stop, the 4d Ranch grew to be the biggest ranch in Wyoming and Millie and I were married the following year. The boss died and left everything to Millie and me. I just wish that great old man could have lived long enough to have met his three grand-kids. Copyrights reserved by the author. If in doubt, please click on ‘Copyrights’ for details.